Posted in Data, News, Research, under North America. Tagged with America, applications, Council of Graduate Schools, enrolments, USA. Data reflecting the number of international students seeking master’s and doctoral degrees from US colleges and universities has continued along a “troubling” trajectory for the second year running, with a new Council of Graduate Schools report showing a 1% decline in international graduate enrolments from fall 2017-18 and a 4% drop in applications. According to the report, the overall decline is driven by a 6% decrease in applications and a 2% decrease in first-time enrolment to master’s and certificate programs. By contrast, first-time international doctoral enrolment grew by 3%. Prior to the drop from 2016 to 2017, the rate at which international graduate students applied and enrolled in US graduate schools had not fallen since 2003. However in recent times, key stakeholders in US international education have warned that the Trump administration’s stance on immigration, coupled with delays in visa processing would tarnish the country’s reputation and continue the downturn in US international student enrolment. “This is the first time we’ve seen declines across two consecutive years, and while we think it’s too soon to consider this a trend, it is troubling,” said CGS president Suzanne Ortega. In terms of country of origin, China and India continue to represent the largest shares of international graduate applications, first-time international graduate enrolment and total international graduate enrolment. However, for the second year running, the final application and first-time graduate enrolment of Indian students experienced large decreases (-12%, -2% respectively). “Nationally, China and India—the two most populous nations in the world— remain, unsurprisingly, as the two largest countries of origin for international graduate students,” the report read. Meanwhile, graduate applications from Middle Eastern and North African students fell by 14% during the same period, while graduate applications and first-time enrolment of Iranian (-27%, -8%) and Saudi Arabian (-6%, -21%) graduate students also decreased. In stark contrast to the substantial 18% increase in applications from Europe between fall 2016 and 2017, graduate applications from this cohort declined by 13% in the fall 2017-18 period, while first-time enrolment of European graduate students also decreased by 3%. Conversely, applications and first-time enrolment of Sub-Saharan African students increased by 28% and 5% respectively. In addition, changing economies in countries of origin and preferences for specific types of universities and fields of study also influence international enrolment trends. Across broad fields of study, mathematics and computer sciences (6%) and health sciences (5%) international graduate applications increased during the fall 2017-18 period. By contrast, engineering (-16%), physical & earth sciences (-9%), and business (-8%) experienced decreases. Despite the decline in first-time enrolment over the past year, engineering (25%) still had the largest share of international graduate applications in fall 2018. 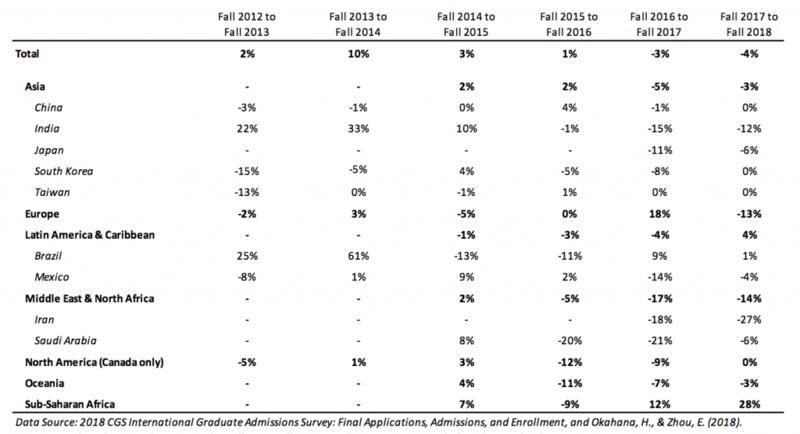 Ortega noted that overall, admission yield rates are comparable to last year. “This suggests that prospective international graduate students remain highly likely to accept offers of admission to US graduate schools,” she added.